Save BHD 0 (0%) Earn 22 Shukrans What is Shukran? Shukran is the Landmark Group’s award-winning loyalty programme in the Middle East, which allows you to earn Shukrans when you shop any of our brands. 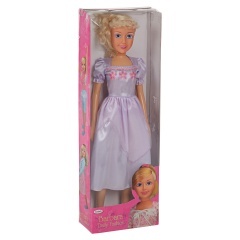 This fashion doll has been designed to become your child's one of the favorite collectibles. She will love to dress her up, try on different hair styles and have hours of fun.